Mary Nealy’s Ten Plagues is a cop thriller that never lives up to the promise of its central premise. While it’s not remarkably original—at least for those who’ve seen the David Fincher movies Seven or Zodiac—the notion of a serial killer whose murders mimic the ten plagues from the book of Exodus 7:14-25 is at least tantalizing, rife with the possibility of metaphor and Old Testament symbolism. 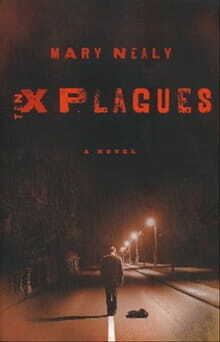 But while Plagues works on the basis of the suspense in this premise, it doesn’t dig into the meat of its characters or conflicts enough to realize its potential. In the novel’s first chapter, Chicago police officer Keren Collins investigates an abduction and explosion at an abandoned building in one of the city’s seedier neighborhoods. There she meets Paul Morris, a cop-turned-pastor who spends most of his time among the homeless and drifters at a local mission. As Collins connects this abduction with several others, she turns to Morris, whose interest in the case heightens when he realizes the victims are typically chosen from among his regulars, and the killer might be living at his mission. Quickly, Collins and Morris discover there’s more behind these crimes than a standard sicko. The killer identifies himself as Pravus, and as the murders continue, the pair begins to suspect he might be a demon. This spiritual warfare component is obviously Nealy’s attempt to add a twist to the standard cop tale, but in the process of crafting a suspenseful whodunit, the nuances of this theme are never fully explored. Not enough is made of Collins’ unique gift: she can sense demonic possession. While this could have added an intriguing internal struggle to Collins’ chase after the killer, it mostly just becomes a handy way for her to tighten the net around him as the novel reaches its homestretch, functioning almost like a spiritual GPS tracking device. In addition, because the novel’s antagonist, revealed to be disgruntled artist Francis Caldwell, is never rounded out enough to become sympathetic, the notion of his demon possession doesn’t take on much significance. If the killer is actually a man possessed by a demon instead of just a really bad man, does this make much of a difference? If Nealy had taken the time to round out Caldwell—he’s not given much to do outside of growling menacingly into the phone at Collins—she could have given the reader some meaty discussion of the nature of evil. In Plagues, Nealy succeeds at crafting an intriguing premise and attempting to imbue the cop/serial killer genre with some spiritual meat. But for this novel to achieve something more, a bit more metaphor is needed, something universal in the inner struggles of Collins and Morris. But we’re not given the luxury of traveling their inner geography extensively enough to fully achieve this understanding. Morris battles against the anger and callousness of his former life as a cop, but does so in too robotic a way, often aware of his tendencies at the crucial moment, so he can avoid slipping and falling back again. But these struggles don’t ring true; we don’t always realize we’re heading down a dangerous path until we’ve gone too far to come back. This subtlety of characterization is part of the appeal of these types of stories; although they’re familiar, the inner struggles of these heroes and villains will always appeal to our innate curiosity. We know the good guys will win; what we’re waiting to discover is at what cost.